Despite the failure of the corn and the squash, we've had an excellent tomato crop this year. Mom, Dad and I are eating a tomato each every day. The Better Boy hybrids are great slicers and very meaty, they would be great on sandwiches but I eat them with just a sprinkle of salt. The Cherokees are super juicy and sweet. Both of them have been excellent. I think the Cherokees have the slight edge on them for flavor. 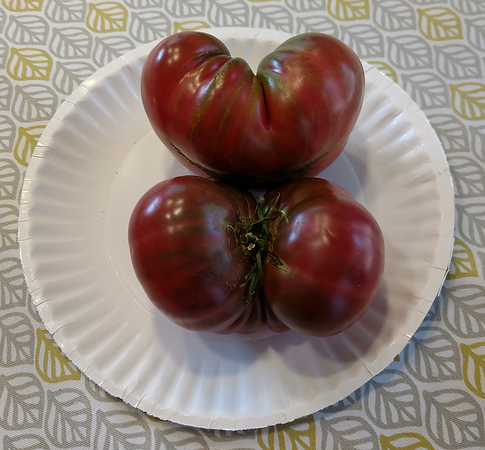 Paper plate shown for scale... two of the really Big Ugly (tm) Cherokee Purple tomatoes. btw, I dumped the squash (dirt and all) in the alley back behind the garage. They're happily still growing. No fruit at all, which is why they ended up back there, but they sure ain't dead. The watermelon is chugging along, no fruit on it either but it's too hot for me to go out and do anything about it. This entry was originally posted at https://laridian.dreamwidth.org/2908914.html. Please comment there using OpenID. 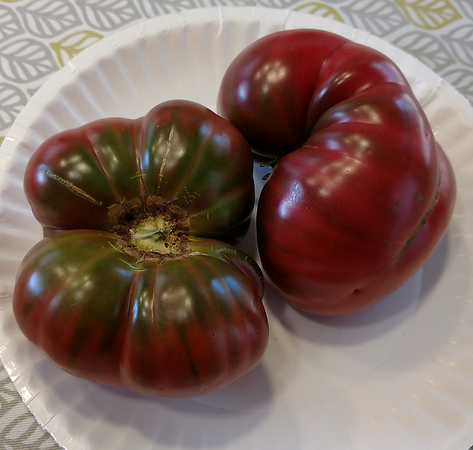 You can see why stores would rather have nice round solid red tomatoes, but dang, these are pretty AND tasty. Just hard to slice for sandwiches. :P tbh I think they're too juicy for sandwiches. But man oh man are they good for eating straight up.